If you think you know Paolo Nutini, think again. His two million selling 2006 debut album, These Streets, established the young Scotsman as a leading light amongst the new wave of singer-songwriters. Paolo's extraordinary follow up, Sunny Side Up, casts him in a whole other light. "Musically where I'm at, I don’t really have a genre or style that I feel a part of," explains Paolo. "It's a bit of a random mish mash. I honestly wanted it all to come out, and not harness it, not manipulate it. I just wanted it to be organic, and so immediate it's in your face and you can't help but take it all in." 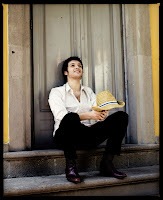 I you stop by my blog you'll se how much I love me some Paolo! "Candy" is a beatuiful song! "No Other Way!" is beyond wonderful. You will a case of the warm fuzzies after listening to these songs! Love him best when he stands up straight & is freshly shaven & a bit sober! They party a little too hard in the UK.....so any Live Gigs at night(after 5 pm).....everyone is snookered even the bands. Although he gets so into the songs sometimes he just high on the music. I love when he does TV shows or just sings live for small crowds/gigs/radio shows. His new Sunny Side Up is #1 in the UK! Don't you just want to give that Boy a Big Hug & a Kiss or two?